It is a pleasure to be here in the historic city of Lima, Peru for the Summit of the Americas. I express gratitude for the excellent hospitality extended to our delegation by the Peruvian Government and people. We have come to appreciate why Lima is considered among the culinary capitals of the Americas. My Government was elected last year to deepen and broaden economic growth, development and equality of opportunity. Throughout the hemisphere and beyond, citizens are demanding new standards of accountability, transparency and inclusion in the business of governance. We gather under the theme” “democratic governance against corruption”. Our predecessors recognized at the origin of our summits the burden of corruption. Some twenty two years ago member states of our hemisphere took the bold step of adopting the Inter-American Convention against corruption, the first international agreement of its kind in the world. They recognized the need to root out corruption at the very foundation of our Inter-American system as being necessary for the preservation and strengthening of democracy. This principle was reaffirmed by heads of state and governments at the three early summits in Miami, Santiago, and Quebec, and reiterated at subsequent summits. Further, member states understood the social costs of corruption, which distorted our economies and the allocation of resources for development. Members further recognized the negative impact of corruption as a hidden and illegal tax on trade, economic development, growth and investment. In the face of mounting challenges we must strengthen our collective will and resolve to confront corruption. Our summit in Quebec City in 2001, saw the birth of the Inter-American Democratic Charter when the “democratic clause” was agreed to by heads of state and government. The adoption of the Inter-American Democratic Charter at Lima in 2001, embodied our commitment to democratic principles, and the essential elements of democracy, enshrined in article 3.
and the separation of powers and independence of the branches of government. The people of the Americas are demanding greater transparency and participation in our democratic process and we must and we will move resolutely to fulfil this obligation. In response to the demand for better governance, my government has adopted as a core governing philosophy, a non-tolerance for corruption policy. We are strengthening public institutions to enhance government transparency, accountability, and good governance. to amend our Nation’s Constitutional to establish the independence and autonomy of the Office of Director Public Prosecutions. The task of perfecting governance will always be a work in progress. But we must continue our commitment to transform cultures of impunity, mistrust and lawlessness, into cultures of accountability, inclusion, and respect for the rule of law. The Bahamas firmly endorses the tenets of the Lima Commitments document. These Commitments establish a baseline which each country of the hemisphere should aim to achieve. The tenets are tools for us to hold each other accountable. It is only through cooperation and collaboration that countries will be able to curtail the webs of corruption that often extend across borders, after involving transnational criminal activity in our interconnected world. Accordingly, we are pleased that the Lima Commitments acknowledge the importance of technical assistance, to ensure states have the necessary support to implement regional and, international anticorruption obligations. We also applaud the inclusion of a mandate to establish a hemispheric focus upon tax information exchange which has, until now, been a rather one-sided, indeed lopsided, conversation. Too often as small states we are subject to norms developed without meaningful engagement from us, norms which may not be applied uniformly to all jurisdictions. We look forward to a balanced dialogue, where we meet as equals on matters that are of importance to us all. When setting regional or international standards, there is the need to minimize unintended consequences that negatively impact small economies in the region, especially when devising regulatory mechanisms. For many developing countries including small island states in the Caribbean region, for instance, the unintended consequence of loss of correspondent banking relationships requires a collaborative solution as stated by IMF Managing Director Christine Lagarde in 2016. We must ensure that our efforts do not have as a backlash erosion of regional financial stability and inclusion. It has long been established that the active participation of citizens in civic and political discourse is fundamental to consolidating democracy, promoting human rights and enhancing social justice. 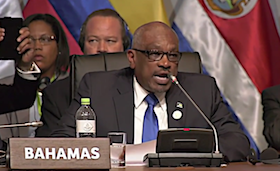 The Bahamas is pleased with the prioritization of education in the Lima Commitments document, given the important role education can play in preventing corruption and bolstering democratic governance. Last February in The Bahamas, our hemisphere took a momentous step forward by adopting the Inter-American Education Agenda. The Agenda solidified our collective commitment to education cooperation and our common agreement that the provision of quality, inclusive and equitable education is the necessary precursor to sustainable development. In my country’s role as Chair of the Inter American Committee on Education, we commit to working with the OAS Secretariat, Member States and relevant international and regional entities to animate the mandate for a hemispheric initiative that focuses on civic education implementation of the Inter-American Education Agenda. Together we will work to expand and strengthen civic education in the hemisphere. We will also work to improve civic literacy through the development of skills that foster engagement and active civic participation. As I close, I reiterate the commitment of The Bahamas to the ambitions set forth in the Lima Commitments document, and to the joint task of strengthening the institutions of the inter-American system which will help us meet our shared goals. Let us give our citizens the governments that they deserve. Let our efforts here in Lima be the catalyst for a new era of responsible, accountable and transparent governance across our hemisphere. Together we can build the dynamic, democratic and inclusive Americas that we all want.